In this circuit tutorial, we’re building a simple Function Generator Circuit which can generate waveforms – Sine waves, Square waves and Triangular waves. The core of this circuit is IC L8038 – which is basically a function generator chip capable of generating different waveforms. 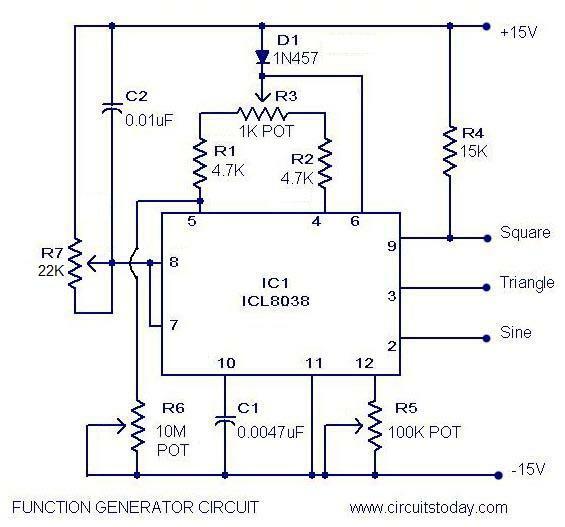 The ICL8038 is a function generator chip, capable of generating triangular, square , sine, pulse and sawtooth waveforms . From these sine, square & triangular wave forms can be made simultaneously.There is an option to control the parameters like frequency,duty cycle and distortion of these functions.This is the best function generator circuit for a beginner to start with and is of course a must on the work bench of an electronics hobbyist.The circuit here is designed to produce waveforms from 20Hz to 20 kHz.The ICL 8038 has to be operated from a dual power supply. Function Generator Circuit Diagram & Parts List. The circuit needs a dual power supply. A +15 -15 power supply as shown in the circuit is enough for the purpose. The frequency of the output wave form can be adjusted using R7.It must be a 100K Log POT. The duty cycle can be adjusted using R3 , a 1K POT. The distortion of the wave form can be adjusted using R5 , a 100K POT. Square,triangle & sine waveforms can be obtained simultaneously at pins 9,3,2 respectively. How can we simultaneously set pulse width of 130 to 500us and frequency of 20 to 30Hz in a rectangular waveform ? I’m trying to set them both but if I set PW to 130 to 500us, my frequency changes and vice versa. How to deal with it ? what if we want to add lcd display as well? can we can use diode in4007? how can we increase the range so that it operates from 0Hz to 200Khz?? please tell us the substitute diode for 1N457 and its working in this ckt. Can this circuit produce a triangular wave 100v (-50v to +50v)that is 50v peak to peak? We want an improved vasion of this diagram which will be controled by a computer system. how to change this circuit to be able to make 25kHz ? salo koi sasta sa tarika nhe bta sktey???????? im trying to build this circuit. are you saying that i have to put a 10uF cap before the +V and -V? so thats 2 caps? and what is the 0.1 disc? Hi Mr Faisal is correct it important that you decouple power supply both positive and negative at the IC end to common with 10uF and a 0.1 disc (one set for positive supply and one set for negative supply). This circuit works.But you should use two capacitors of 10uf(polar) and connect one capacitor with V+(positive leg of capacitor) and second capacitor with V-(negative leg of capacitor) and remaining two terminals of capacitor should ground.Then this circuit will work.Don’t use this circuit as it if u use then your IC will be damage. the dual power supply is AC or DC? PLEASE SEND ME A TWO FREQUENCY SQUARE WAVE FUNCTION GENERATOR CIRCUIT DIAGRAM TO MY MAIL. we have required walkthrough metal detector circuit . any chance for showing us the output waveforms??? Thanx for the circuit, btw.